This was the bonus project for registering early for the fabric class. 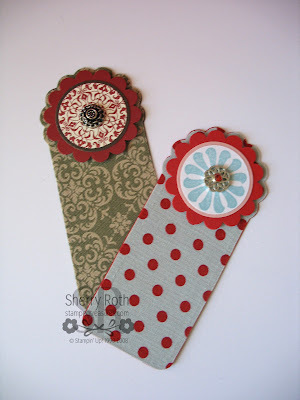 It's a book mark but I thought it would make a great gift tag as well. The back is cardstock, so you could stamp to and from on it and then the receiver could use it as a book mark afterwards. I do have a couple more projects to show you that they created, I just need to take and edit the photos. Hopefully, I will be back to show you those tomorrow.